Today is officially the last day of homemade baby food week! I hope you gained some knowledge or was able to pass it on to someone who could benefit from it. I had so much fun telling you about my process but I’m excited to get back to adult food. And get back to not posting every day. Phew! That’s exhausting. Thankfully my husband is a high school assistant principal who has time off during the summer. I couldn’t have blogged every day if not for his help. To close, I want to do a summary and some tips…and some confessions. Oh and I’m giving away a Blendtec blender. YAY! What we covered: Vegetables, Fruit, Protein, Baby Led Weaning Overview, and Feeding Your Toddler. Click any of those links to learn more about each topic. Why make your own baby food? We discussed reasons of: saving money, controlling the quality, introducing variety, using fresh products, and adding flavor. When? 4-6 months of age. Ask your pediatrician! 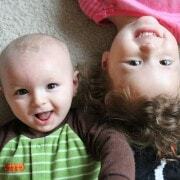 I started both of my kids at six months of age. PS: You still have a little time to enter to win a great OXO Tot Prize package! Don’t stress yourself out. This is really pretty easy. 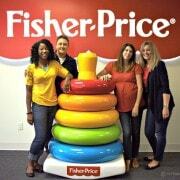 Cook food, purée food, freeze food, thaw food, feed baby. Repeat. Over and over and over and over again. Do just a few foods if you don’t have time to prepare ALL homemade baby food. It will save you some money. Take a day to knock out 4 or 5 purées and get them int he freezer. Organic? Local? Frozen veggies? It’s all up to you. Do what feels right to you. Have FUN. And take photos of your baby with carrots all over his/her face. I don’t do 100% homemade. Sometimes it’s easier to just grab a jar and throw it in the diaper bag, ya know? When we’re traveling, I almost always fall back on the pre-made stuff. I use store-bought rice cereal. Yep. I do. I like that it’s fortified with iron. I like that if my baby food is runny, the rice cereal thickens it right up for me. I like that I don’t have to grind rice and cook it every day. I have to cut corners here and there or I’ll never survive. I’m not perfect, and you don’t have to be either. You can do some homemade, some store-bought…your baby is going to be just fine no matter what. Now, should we talk about this awesome giveaway?! 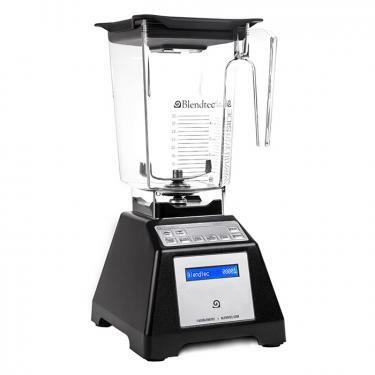 One (1) winner will receive the Blendtec Total Blender Classic Wildside (a value of over $450.00!). I’m a little bit obsessed with this blender. Not only t GREAT for baby food (super smooth purees!) but it is also fantastic for SO many other things. I made graham cracker crumbs with it, a milkshake, smoothies, and so much more! It can even make soup and hummus. You’ll find yourself using this blender every. single. day. so don’t even think about taking it off of your counter-top. It is powerful, easy to clean and sturdy on your counter. It also keeps track of how many things you’ve made in it which I think is such a fun feature. I would make smoothies. We’ve really been trying to eat healthier and my current cheap-o blender has a hard time making smoothies. They should be called chunkies! They’re still tasty, but a better texture would be wonderful! 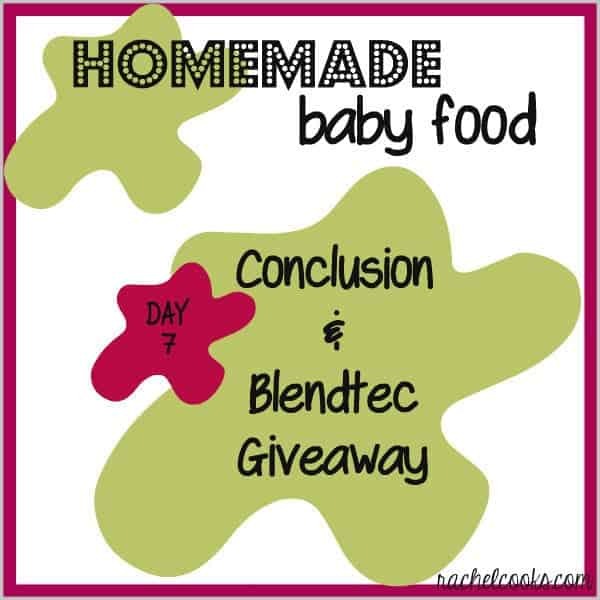 Hi I would love to win a blendtec blender! I have heard so many great things about it! I would make purees! I’ve had my eye on a Blendtec for quite some time now!! It would make my morning smoothie ritual a breeze!! I would make some Pesto using my fresh Herb garden. Pesto. My herbs are calling to be used. I would make chocolate banana strawberry smoothies for my kids. I’d start off with some nut butters and hummus. Everyone in the house loves hummus but I have never made it myself. It sounds fairly easy with the right “tools”. The first thing I’d use the Blendtec for would be an ice cream mixture. I’ve been wanting to make blueberry ice cream, and it would be a snap to whip up the base in a Blendtec. I would do perfect smoothies eeeevery day! I think I’d have to make margaritas to celebrate the last month of summer! I think I’d make margaritas to celebrate the last month of summer! I’d make a protein shake! I LOVED this series! Thank you! I sometimes struggle with ideas for different combinations…I wanna expand his palate, ya know? :) Love the tips about toddlers from Liz too, so helpful! It has already started a diet overhaul on my two year old. Thank you so much for the push! 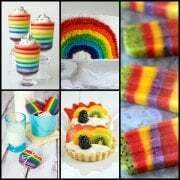 :) What Id make first? Probably honestly a smoothie, because I know that I make a couple of those every.single.day! Smoothie. Or maybe a pureed soup. I would love to make a wild berry banana smoothie! I would make some milkshakes! Yum! Thank you. Roasted butternut squash soup. Yum! Oh some sort of fruity blended drink for sure. My son loves avocados, so maybe some guacamole! I’d make milkshakes and pesto first thing! I would make a fruit shake for my grandson. I’d make green monster smoothies!! I could make pureed carrots for my new granddaughter. I would make smoothies in this blender. My current blender has to work way too hard just to blend ice cubes. I would make fresh tomato soup! I’d make a green smoothie. I would love to make some nice Green Power smoothies (with fresh greens from my garden) to help with my MS. I have several recipes but no decent blender or juicer. If I won this I would make a margarita to celebrate! I would make pesto! Mmmm! Milkshakes are the first thing I would make with this blender if I win. I would make a roasted red pepper sauce. well, I am starting a new diet and this would help blend the smoothies that I need to drink-a whole lot better (than what I have). plus it will help my hubby eat the veggies if they are blended up. The first thing I’d make are vegan date balls! I’d make my own coconut butter (manna)! Paying 13 dollars for a 16 oz jar is not my style. I would make a gatspacho. More of the yummy & super healthy smoothies my niece has turned me onto! I would make broccoli cheese soup. I think I would have to start out with something simple, like a smoothie, but there are SO many things that I would love to make using this blender!! Thank you!! I would make a chocolate milkshake first thing! That’s easy…I’d make smoothies for everyone!!! Since blenders typically hate me, I usually end up using my food processor. If I won this amazing blender, I’d like to try making a green smoothie. I’d whip up a breakfast smoothie– it takes like 15 minutes in the crappy blender I have now! i’d make a strawberry banana smoothie! I want to try making some mayonnaise! I would make smoothies for breakfast. Orange Julius- perfect way to cool off this summer! I would definitely make my kids’ favorite smoothie! My old blender broke down when I made smoothies for the kids last time. So, it’ll be wonderful to have this super machines in my kitchen! Thanks for hosting the giveaway! Can’t wait. What a great giveaway! One of the first things I would make would be a green smoothie…they’re so yummy! I can’t wait to use this to make green smoothies! Fruit smoothie! May be for me since LO isn’t here yet! I would love to make a Mango Protein Smoothie. Id love to make some fresh pesto. Or baby food for my baby!! It keeps track of how many things you made in it?? How cool! I’m don’t have kids yet, but I’ve always dreamed about making my own baby food when I do! My family loves smoothies, so that’s what I’d make first. Our regular blender doesn’t grind up frozen fruit very well! I would make pecan butter and almond milk. I would probably make some fresh salsa. I’m pregnant and craving everything tomato! I would make a vanilla milkshake. This blender looks amazing!! Would love to try homemade hummus & of course smoothies!!! I would make smoothies with this awesome Blendtec. Thank you for such a great giveaway. Oh my, I wouldn’t know where to start. Our appliances are 13+ years old & showing their age. My daughter is gluten, dairy, & egg intolerant so I’m sure we’d go crazy making all the vegan desserts we can’t do with our current blender. Thanks!!! I would love to make a green smoothie first! I would use spinach, banana, mango, and peaches! I have a 3 month old and we neeeeeed a blender for when I start making her foods and just can’t afford one as nice as a Blendtec. I would definitely make her some yummy puréed foods in this bad boy! Great blender !! I would make my famous breakfast protein shake ! Thanks ! My blender just died so this would be so great to win. The first thing I would make is a smoothy from all the great berries I have been picking. I would first make a celebratory milkshake!! Since I’m trying to end the summer being good, I’d make my favorite mango-spinach smoothie. Certainly not an Oreo milkshake…. My husband and I just started making green smoothies everyday and this would be awesome. I would make lots of smoothies and margaritas! I would make homemade almond milk. I would probably start out with my breakfast smoothie, but I do want to try out making my own baby food for our 5 month old. I would make healthy green smoothies! I would make rice milk daily and save money! I would also love to make yummy smoothies with the whole fruit for my food allergic child. I’d make hummus or pesto (minus the nuts due to food allergies) and then I’d try out the rest of my new recipes! I would LOVE to make a chocolate banana milkshake! I have a whole list of smoothies I want to make. The first one being with in season peaches. I’d make a mixed berry smoothie! I would make a morning fruit smoothie for my little guy! I’d make a green smoothie with a little frozen banana or cooked sweet potato for thickener. Mmmmm! Hmmmmmmmmmmm probably butternut squash soup!!!! I would make smoothies and baby food! I would probably make a chocolate milkshake…maybe with some peanut butter! I’d probably make a giant green smoothie! I would make soo many smoothies! I would make baby food for my grandson. I would make ice cream! homemade baby food for a mom of two babies(ages 4 & 2) ready to have her third. I would make a kale-banana-berry-pineapple-coconut milk smoothie! OK, I know this will sound strange, but I can’t wait to CRUSH ICE with it! I want to make my own Frappucino’s. I’m SO tired of spending $6 for them! Oh, green smoothie… I miss you! Blendtec rescue me! I would make a green smoothie with kale ! Would make homemade marinara sauce first! I would like to be virtuous and say I’d make a smoothie … but really it would be the kind of smoothie that has ice cream in it. I would definitely try my hand at making homemade hummus first. I’d make a Hot Pink Breakfast Smoothie! Baby is still 4 weeks away so in the mean time I would make hummus..or milk shakes! Breakfast Smoothies would be the first thing I’d make (first meal of the day)! I’d go for the best vanilla milkshake I can dream of. Yummy. I’d start with a chocolate shake. My baby boy is 5 months, I quite my teaching job to stay home with him….I am gearing up to give him solids – I would make all his food in it! The first thing I would make is a coconut smoothie or a vegetable puree. The first thing I would make is baby food. This is what brought me to your site. Happy to have you here, Deborah! Good luck! Baby food since my second son is now ready to eat solids. I would make something cold… to beat the never ending heat here in Arizona. Thanks for this opportunity! I would make chocolate, peanut butter, banana smoothies. I’d love to make a nice, cold caramel frappe! I would make my famous chocolate milkshake for my kids. The possibilities are endless! Usually we make smoothies, with fresh fruit and protein. But we have made, almond butter, peanut butter, almond meal, rice flour, etc. I love smoothies so I would make a Strawberry, Banana & Yogurt Smoothie if I won the Blendtec Blender.